We’ve all had furniture we “just loved” until the dog peed on it or the cat scratch her lovely claws down the upholstery or little Johnny spilled his grape juice all over the cushion. When does the damage from every day life mean it’s time to splurge on new furniture? Is it when the movers knock a leg or two off or when little Maggie cuts a hole in the back with her new scissor skills? Is all damage repairable? The majority of damage to your furniture can be repaired. In fact, there are businesses that specialize in furniture repair and can even reupholster your furniture to look brand new. However, if you have experienced some of the aforementioned minor damages, you can do the repairs at home. If you have a stain or spill on your furniture, you can usually remove the stain by using one of the many stain removal products on the market. However, a cheaper and more available option if you don’t keep stain remover in stock is laundry or dish detergent, warm water, and a tooth brush. Simply put some detergent with the warm water (don’t mix it up), dunk the tooth brush in then scrub the stain gently and it will disappear. For fabric scratches, tears, or rips, it might be best to trust tough ones to the professionals. 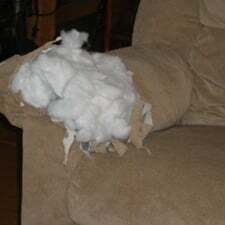 However, rips in your cushions can typically be fixed easily by removing the cushion from the couch and simply hand sewing the rips or tears. Many couches and cushions utilize covers which makes sewing the holes easier, especially when using a machine. When furniture is completely broken down and uncomfortable, it may be time to get rid of it. Really the call is yours to make. Professional furniture repairers and do-it-yourself repair projects usually can solve the damages incurred from everyday life. However, if you’re looking for a reason to get a new set and little Johnny accidentally dumps his grape juice all over the cushion, there’s no harm in saying that the damage is too much damage to repair.